I was going to call this a “rustic” or “freeform” tart, store but let’s be honest here. This is the tart of a lazy person. A person without one of those cute tart pans with the scalloped edges. Someone who has no patience for trimming dough or crimping edges. This is a haphazard, decease thrown-together kind of tart. And it doesn’t matter one tiny little bit. It’s still delicious. Tomatoes have always been one of my favorite foods. Growing up, I’d sneak the them from the cutting board while my mom prepped the salad. I can eat simple, naked tomato slices all day long. Especially the juicy heirloom varieties piled up at Whole Foods this time of year. So, imagine my dismay when I discovered that my boyfriend (now husband) was no fan of tomatoes. Inconceivable! Over the years I’ve managed to sneak him enough good tomatoes to change his mind. They’re still not his favorite food, but he doesn’t pick them out of salads and sandwiches anymore. And he most definitely wouldn’t pick them out of this tart. The tomatoes practically melt into a sauce over the goat cheese and the olives add just the right amount of briny contrast. Sprinkled with basil ribbons and drizzled with really good olive oil, this is just about the most perfect summer tart. It’s not fussy or finicky or time-consuming. The hardest part is waiting for it to come out of the oven. This is the tart recipe for those of you without the fancy tart pan, but who still crave a flaky, buttery crust filled with summer’s best. This recipe makes 2 tarts. If you only want 1, I recommend you make the entire dough recipe and freeze half (instructions below). Then just halve the filling ingredients. Place the flour and salt in a bowl then add the butter. Using a knife or nifty pastry blender*, cut the butter into the flour to form large crumbs. Add the water and mix (I like to use my hands) until just combined. Place a piece of plastic wrap on your work surface, then dump the content of the bowl onto it. Wrap tightly and refrigerate for at least 20 minutes or up to a day. You can also refrigerate for 20 minutes, then place in an air-tight ziploc bag and freeze. When your ready to make your tarts, preheat the oven to 375°. Cut the dough in half, then sprinkle each half with flour and roll out into a thin round. 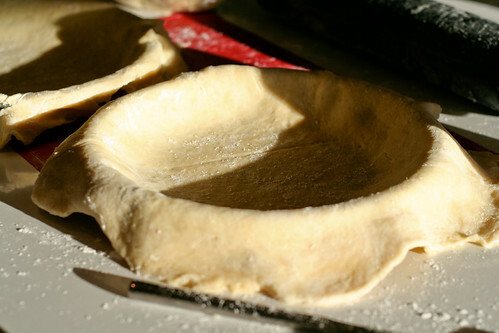 Place the rolled dough into a pie pan, letting the edges hang off the sides (see image). Repeat with the other half of the dough for a second tart. Place half of the goat cheese in an even layer in each tart. Remove the seeds and extra juice from the tomatoes, then add them in even layer over the goat cheese. Sprinkle the top with the chopped olives and salt. Gently fold the edges over the top of the filling, crimping where you need to. 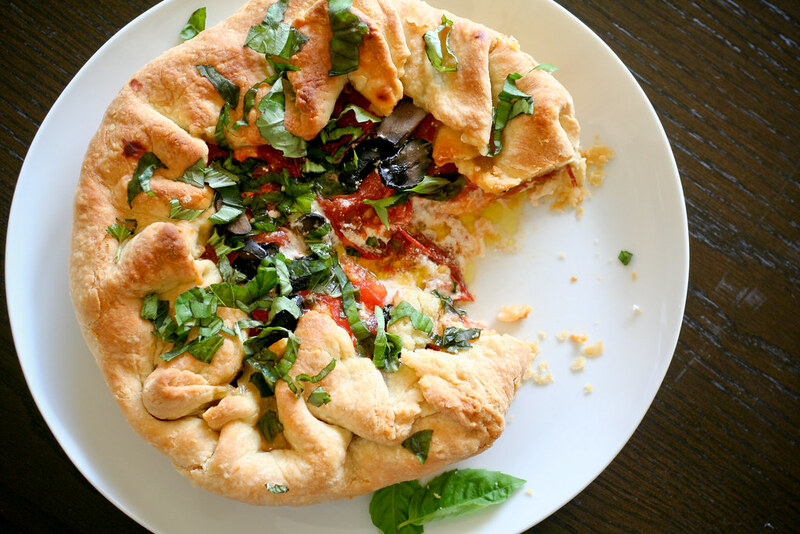 You’re basically covering the edges, but leaving a hole on top where you can still see the tomatoes and olives. Repeat with the second tart. Bake for 45 minutes, or until the tart shell turns golden. Remove from oven and let cool for about 10 minutes. Sprinkle the basil ribbons over the top and drizzle with olive oil. Makes two 9-inch tarts, or about 8 – 10 servings. While my boyfriend loves tomatoes, he is not a fan of olives. I suspect I’ll have more difficulty winning him over with olives that you did yours with tomatoes, but damn if I won’t try! This might be the perfect recipe to convince him! This looks so delicious. I can’t wait to make it. Thanks! I just bought some heirloom tomatoes at the farmer’s market! And I have all the other ingredients in-house. This is on the list to make tomorrow, I think! Looks stellar. So good. I made something very much like this the other day. And although I do have a tart pan, I did it semi-free-form, which I like to think of as “I really love tart crust”-style â€” because, really, why waste all that buttery goodness? I was looking for something to take to a housewarming party on Sat and this will be perfect. Oh wow!!! This is lovely…I can’t wait to have it. I believe your gorgeous “rustic/free-form” tart can actually be classified as a galette which is the fancy term for it. I tried Smitten Kitchen’s http://smittenkitchen.com/2006/10/when-the-funk-hits-the-fan/ last week and now I can’t wait to try yours! This looks so incredibly delicious. I love those flavor combos together. Can’t wait to try this! what a beautiful, delicious-looking tart and I even have all that’s needed to make it! Yes, this is a wonderful take on David Lebovitz’ recently posted French Tomato Tart (or maybe it’s not a take, just similar). 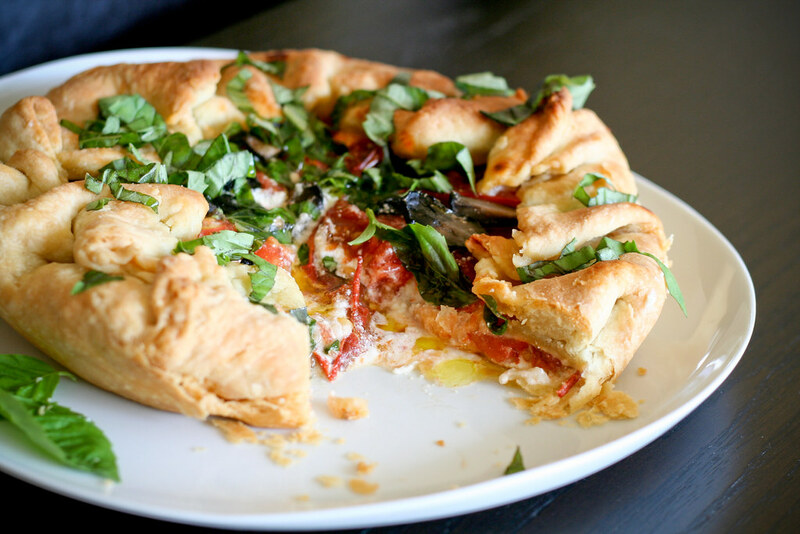 I also made my version of his tart this last week – such a nice way to celebrate summer tomatoes! I hadn’t thought of adding olives… great idea. Made this last night. I waited too long and couldn’t get heirloom tomatoes at the market. Fortunately I had roasted tomatoes in my freezer – they worked great. I served it as an appetizer and it was the hit of the party. Ive been gone for some time, but now I remember why I used to love this blog. Thanks, I’ll try and check back more often. How frequently do you update your blog?